Wake up to beautiful mornings with our custom window coverings. 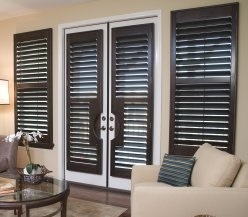 We provide a large selection of high quality, affordable Shutters and Blinds. Each of our window treatment products offer a variety of colors, styles and options. Our consulting staff will guide you through the process of choosing the correct treatment and product at the lowest possible price. Our commitment is to you, our customer, in that you are completely satisfied with your purchase. Whether you are doing one window, an entire home, or a complex, we will be there to help you through the process from conception to the final installation and ensure your satisfaction. We guarantee it! Based in Boca Raton, Florida, Plantation Shutters and Blinds is a family owned and operated company that prides itself on customer service and satisfaction. Our extensive knowledge of the window treatment industry and available products, allows us to offer our clients priceless insight and advice for their particular project. We will guide you through the process by first finding out your desired results and then help you select the right product for your project. Our product offerings are from national brands such as Hunter Douglas, Norman International, and Graber, as well as our own private label blinds. We never use contract help so you will always be dealing with a principal of the company. From the initial consultation, our family will be working for your satisfaction. Monday to Sunday, 9:00 a.m. - 6:00 p.m.